The module offers two empirical methods for PPP, both in well and volume modes. Calculate total vertical stress (σv) from rock density. Estimate vertical effective stress (σe)from log measurements (DT or RES) or seismic (velocity). Pore pressure is then PP = σv - σe. Calibrate PP to credible information as it becomes available. 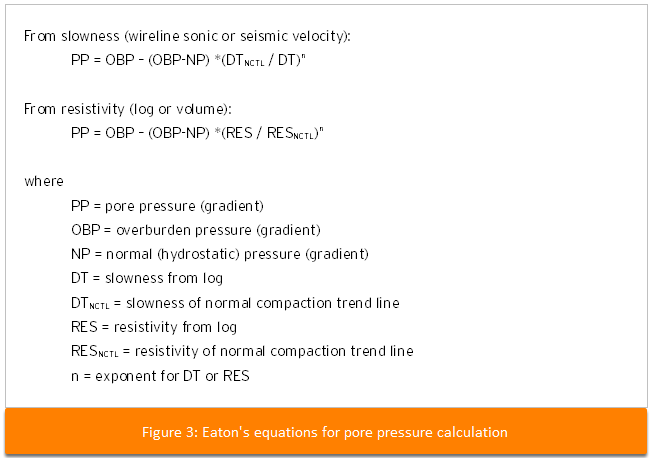 The pore pressure prediction module is utilised to estimate the effective stress (σe), using either Eaton's or Miller's methods, described next. Velocity — uses the observed shale compaction trend (OSCTL) at a well location, or seismic interval velocity from a volume. Resistivity — uses the shale deep resistivity at well, or a resistivity volume. Crucial to Eaton's method is defining the Normal Compaction Trend Line (NCTL), which is the “background” trend of velocity (as slowness) or resistivity, described in Normal Compaction Trend Lines. Calibration of the Eaton parameters in the PPP module are described in Eaton's method. Miller's equation for PPP is described in Figure 4. Pore pressure gradient depends on the measured velocity, and whether depth is above or below the unloading depth. Below (deeper than) a given depth, unloading does not occur (and is the formula used in the PPP module). The physical relationships built into the Miller's (no unloading) equation are: at zero effective stress, the velocity is simply the fluid velocity, and as the effective stress approaches infinity, the velocity approaches the matrix velocity. 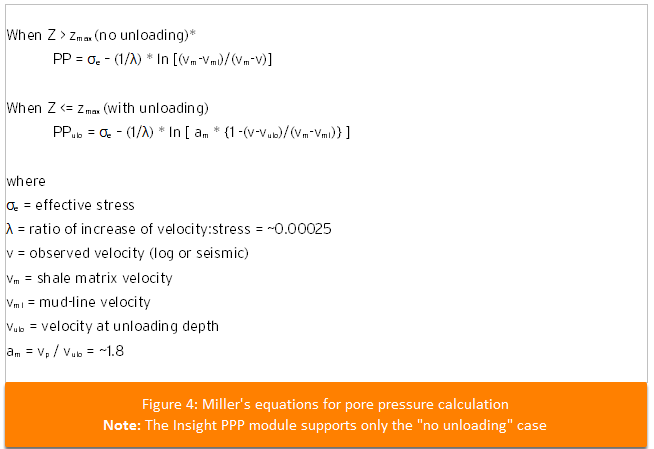 Calibration of Miller's method parameters in the PPP module are described in Miller's Method. The fracture pressure is that at which the formation has tensile failure. Thus, the predicted fracture gradient shows the maximum possible mud weight without inducing mud loss into the formation. The Matthews-Kelly formulation is implemented, defined in Figure 5. You must provide an effective stress ratio (K0), which can be calibrated from leak-off tests (LOTs), described in Leak Off Test (LOT) and fracture gradient example.